Did you know you can customize the OutsideView keyboard to work more effectively and productively for yourself or others? Would you like to press one key and get more than one character? How would you like to press a key and get an entire phrase or command in response? Would you like to map a .NET program or VCB macro to a keystroke combination – so you can invoke it quickly and easily? Would you like to rearrange the keyboard layout to suit yourself, or suit a particular application environment to make more frequently pressed keys more convenient? You can do all those things in OutsideView. In fact, you can do it in multiple ways. You make the keyboard changes you want, and that becomes a keyboard map file. You can create as many keyboard map files as you like. Then you can tell individual sessions which keyboard map you want them to use. Maybe you have one keyboard you have ‘tweaked’ for a particular application. Or maybe you want to use one keyboard map for all your IBM hosts, but a different map when talking to your NonStop. It’s all up to you – OutsideView lets you choose. 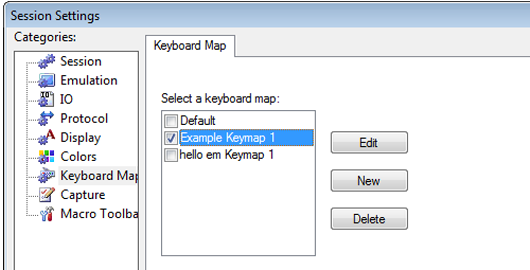 Example 3: It’s easy to select between multiple custom keymaps. Would you like additional information about using the Key Mapper features in OutsideView?